The official history of Landfort begins in 1434 when this noble estate is first mentioned in a document. In that year, Johan van Assewyn handed the country house over to Diederick van Bronckhorst. It was then called Lanckvoort, which is why we now think that there was a ford in the Oude IJssel river here. For centuries, this lovely domain has been situated on the Dutch-German border. It is remarkable that concern about money forms a constant element in the history of Landfort. Up until the nineteenth century, bankruptcy and lack of funds were often the reason for the property to change owners. It is also remarkable that, despite being situated on the Dutch-German border, Landfort only suffered serious war damage during the last days of the Second World War. During the previous centuries there was only neglect by owners who lacked financial resources. Some could not pay off their debts, while others ran into problems as they could not sell Landfort or could not accept it as inheritance due to poverty. Yet others would repeatedly take out loans on the property in order to keep their heads above water. When the country house is put up for auction in the near city of Emmerik in Germany in 1610, it comprises over sixteen hectares or eighteen morgen of land. At the time Landfort was called a ‘havezate.’ This term meant that the ownership was in the hands of a nobleman. At that time there were canals, an orchard, fishing waters and a hunting ground. Despite the fact that much of the nobility in the east of the Netherlands were major landowners, they are not well represented in the history of the inhabitants of Landfort. The country house has been frequently owned by the affluent middle class or merchants, which even included people from Amsterdam. Landfort looked different in the past compared to the present. In former times it looked more like the current Biljoen castle in Velp, which consisted of a square building with four corner towers, each crowned by a helmet-shaped roof. Around the house there was a canal with a bridge that led to the entrance door. The house had a cellar, two floors and an attic. Each side of the house contained windows with shutters and all this is presumed to date back to the early seventeenth century. It is also possible that some elements from a previous house have been used as well. This was the shape of the house until 1823-25. In those years, everything was renewed and the house obtained its current, elongated form, in which the central part, called the Corps de Logis, was effectively assimilated into the new building. Today one can still see the old sixteenth-century wooden roof structure in the attic of Landfort. The old and shallow cellar under the building also still remains, of which the middle areas are the oldest. 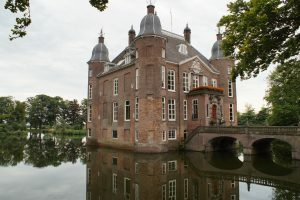 From 1810 the Luyken family acquired the Schloss Sonsfeld-Wittenhorst castle, located near the German town Rees, of which Johann Albert inherited the manorial rights. The origins of the Luyken family are Dutch-German. It is claimed that the well-known Dutch graphic artist Jan Luyken (Spiegel van het Menselyck Bedrijf – “The Book of Trades”) shares their ancestry, but this has never been fully proven. 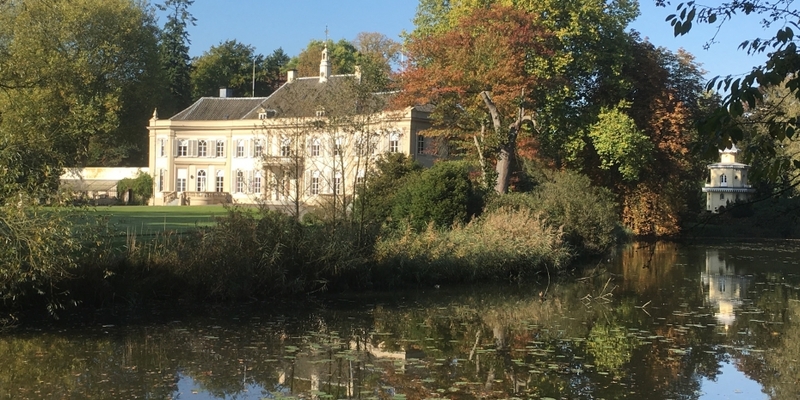 After a troublesome continued existence of several centuries, Landfort came into the possession of Johann Albert Luyken (1785-1867) and the country house underwent a complete revitalisation. Luyken’s purchase was made possible by a financial gift from his 21-year older sister Stiencke Christina Waltmann-Luyken. Her husband was a banker, which made her very wealthy. After his death, the rich (childless) widow wanted to live closer to her German family, many of which lived in the vicinity of Landfort. The only condition for the money donation was that she could also live at Landfort and that any revenues would go to her. Johann Albert Luyken was the third and youngest child of Daniël Luyken (1733-1807) and Christina Gerdrutha Löhr (1742-1823). They belonged to a distinguished family of merchants from Wesel, Germany. After grammar school he became qualified as an eye doctor, surgeon and gynaecologist in Halle and Göttingen. An integral part of the medical training was the study of botany, which would later become his passion. A story about Johann Albert has it that, after having established himself as an eye doctor at the Prinsengracht (no. 464) in Amsterdam, he would have been poisoned by his fellow doctors with deadly nightshade (belladonna). Luyken would have saved himself from death by drinking large amounts of milk. However, the poison would have impaired his hearing so that he was no longer able to treat his patients. Whether or not the latter was true is unknown, but the fact that he was deaf is certain. Perhaps this disability has further stimulated his love for botany. After getting married with his second cousin Christina M.B. Luyken (1797-1849), they settled at Landfort, where his oldest sister also came to live. Later on, he remarried Emma C. Viebahn (1822-1898). He died in 1867 at Landfort, after which the house was passed on to his son, Albert Gustav Hermann Luyken (1856-1933). Johann Franz baron von Motzfelt, who lived at Hardenberg castle, made the highest bid on Landfort on 27 June 1823, yet with the definitive auction fees Johann Albert Luyken became the owner of the property, who offered 20.798.05 guilders. During the auction sale in Hotel Van Dielen in Gendringen he distracted the attention from himself by dressing as a simple farmer. This diverted the attention of the attendants as they assumed that none of the farmers could afford Landfort. After he made his bid, the notary present concernedly asked whether the bidder possessed enough deposits, to which Johann Albert would have replied no, while he pulled out a large bundle of banknotes with which he made the purchase in cash. Landfort was in poor condition due to the various different owners, and it had also lost its characteristic corner towers in previous renovations. After it was decided to renovate and expand the country house, the German architect and contractor Johann Theodor Übbing was called upon. He carried out much work for Fürst zu Salm-Salm at the nearby Wasserburg Anholt estate. 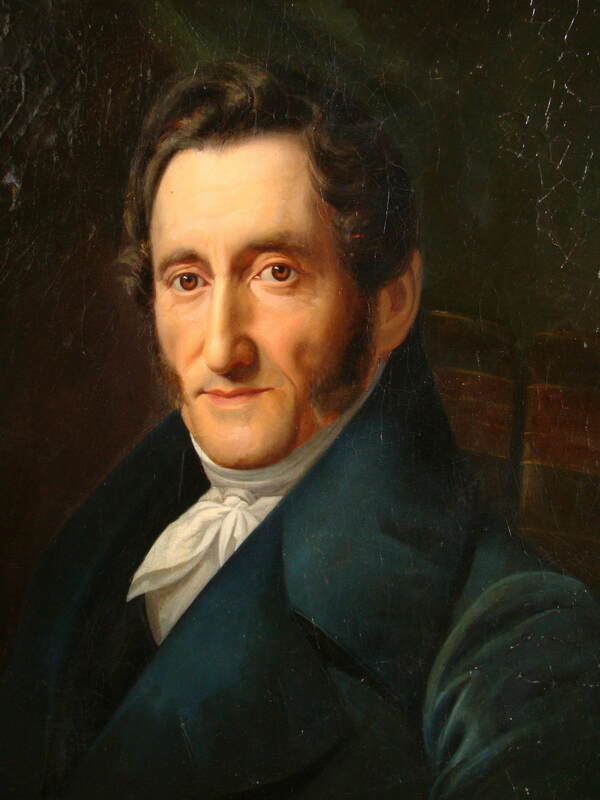 Johann Albert was intensively involved with the renovation and expansion of Landfort. This meant, among other things, that the necessary areas for the extension of the house were furnished for Johann Albert’s botanical hobbies. Furthermore, the house was extended considerably with two slightly fanning-out wings. The presence of an indoor orangery is unique in the Netherlands. In no Dutch country house has such an indoor winter residence for (sub-) tropical plants been realised. Übbing also designated an area as a plant nursery, which is likely to have been realised as well. Also very remarkable was the hot-air heating system in the left part of the house, including the orangery. This functioned using an oven or a stove in the basement. Finally, it is also remarkable that the house does not have a so-called upstairs/downstairs layout. The kitchen and other facilities are located on the same first floor as where the Luyken family received their guests, where the library was located, and where they dined or smoked a cigar. At both ends of the wings there are still stairs, one of which continues to the attic. This way, the resident staff could reach their rooms in the attic without being noticed. In addition to the involvement of architect/contractor Übbing, Jan David Zocher Jr. also became involved in the renovation of the house and the redesign of Landfort’s garden. It is possible that his younger brother Karel George Zocher also worked at Landfort, but what it exactly was that he did there is still unclear, just as their division of roles. The map which Übbing made at the start of the work at Landfort shows that the earlier layout of the land around the house was utilitarian and somewhat geometrical. In other words, it was all a bit straightforward. There was an animal shelter or menagerie, there were coppice woodlands, wooded banks, farming land, a fishing pond and canals. Shortly afterwards, everything was transformed into a scenic whole with winding paths, a meandering brook, and Übbing even designed a so-called pigeon tower in Turkish, Moorish or Ottoman style. This element is also a rare architectural phenomenon in the Netherlands. Luyken owned a large collection of plants at Landfort, and earlier he had created an extensive herbarium during a long voyage through Europe. The herbarium has been preserved and can be viewed on request at the Westfälische Landesmuseum für Kunst und Kulturgeschichte in Münster. There was also a large library with medical and botanical books. In the garden there were multiple rare trees, of which now only a few remain. The Landfort Heritage Foundation (sEL) is considering to restore the diverse wealth of (orangery) plants and tree varieties that have been introduced on Landfort by Johann Albert. In order to realise this, it will be necessary to place a historic greenhouse in the park. Even though Übbing contributed to the garden design, it appears that he could not fully meet the demanding needs of Johann Albert Luyken in the artistic sense. After the introduction of Jan David Zocher Jr. by a friend from Amsterdam, he visited him during the summer of 1825. That year the work at Landfort had begun. The busy landscape architect would, just as he had done for baron Van Spaen at Biljoen castle, make a so-called ‘bird’s-eye view map’ of Landfort. In a letter from Zocher to Luyken he wrote: “With regards to the drawing of the house, it is not yet fully finished, yet I hope to send it to you from Arnhem on my first journey to Gelderland or, if possible, even bring it to you myself.” This indicates that a number of unsigned and undated designs for the house, all in classicistic style, are attributed to Zocher. However, multiple elements of this country house are more German than Dutch: the indoor orangery, the house’s hot-air heating system, the island with family graves, and the Eastern pigeon tower are all elements that occur more often in Germany than in the Netherlands. Although they are not exclusively German, it is likely that Übbing – whether or not by Johann Albert Luyken’s request, who grew up in Germany – played a considerable role in the definitive design of the country house as a whole. The pigeon tower already appears in the design Übbing made for Landfort in 1825, where the pigeon tower in Eastern style has already been drawn in. In fact, it served as a menagerie, and swans, geese, chickens and other poultry were kept there. 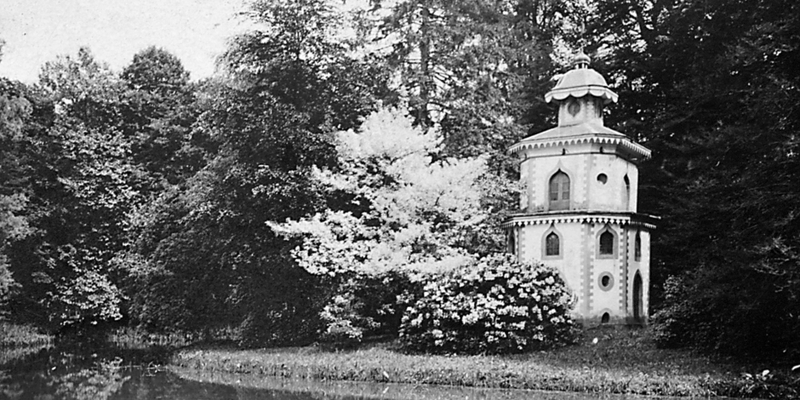 In the margin of the drawing it reads: ‘An elegant, octagonal tower, as a menagerie building with lattice.’ This pigeon tower is a unique Dutch example of garden enrichment in the so-called Eastern, Moorish or Ottoman style. It simultaneously contains certain gothic as well as Chinese elements. One of the design drawings shows the pagoda bells on the edge of the roof, and a second roof that is covered with an egg-shaped tower with a Turkish crescent on top. The upper part of the tower appears to be intended as a watchtower. These were often used at country houses, but here the design has not been fully followed and this element has never been realised. After the Second World War, the heavily damaged pigeon tower was first restored to a medieval tower with a roof. Later on, this roof disappeared and it became a kind of ruinous folly. After 2000, the tower was reconstructed according to old designs and photographs so that it regained its Moorish or Ottoman appearance. In the park there are two bridges, both designed by the engineer Carl August Wilhelm Luyken. During those years his brother Albert Gustav lived with his family on Landfort. The graceful cast iron arched bridge at the back of the garden dates from 1872 and has been constructed at an iron foundry in Isselburg, near Anholt. At the time the bridge was decorated with gold foil and it clearly carried the text ‘Landfort Anno 1873.’ This bridge allowed the residents to access the woodland behind the house for a walk and to pay a visit to the private family cemetery on an island elsewhere in the forest. The robust entrance bridge was designed during the same period and we know that it is based on a fairly complicated building construction. At the end of the Second World War, the main house suffered severe damage. The extensive coach house with its horse stables and gardener’s house burned down and the pigeon tower turned into a ruin. Soon the coach house disappeared completely, and only the foundations have remained. The tree stocks on the island of the house and in the park greatly suffered from the last weeks of the war, too. Descendants of Johann Albert Luyken continued to live in a section of the heavily damaged house. Because of various circumstances, the Luyken family was forced to sell Landfort and a large part of the surrounding land and forests (42 hectares) to the Het Geldersch Landschap Foundation. This foundation funded a partial restoration, in which the facades and roofs were restored. The park was also addressed and the canals were dredged, the filled-in carp pond in the former vegetable garden was excavated and sightlines were restored. As Landfort’s future destination was unclear, the restoration of the interior was put on hold. This only took place after the Rhyngeest Foundation, with architect Bob van Beek, took on the duty of restoring the house and the park for the symbolic payment of one guilder. His major efforts to repair and preserve this historic country house have gained him great appreciation. Thanks to him Landfort has been preserved. The subsequent owner was Peter Rutten. He sold Landfort to the Erfgoed Landfort Foundation (sEL) in 2017.